Honduras’s interim government has rejected a proposal to solve the country’s political crisis, in effect ending talks with the ousted president. The delegation’s head said Costa Rica’s proposal, which would see Manuel Zelaya return as leader of a unity government, was “absolutely unacceptable”. Mr Zelaya’s representatives said they would no longer negotiate with the interim leaders’ current delegation. Mediators have asked both sides to resume talks in three days. 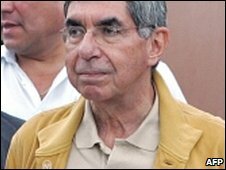 “It was not possible to reach a satisfactory agreement,” said President Oscar Arias of Costa Rica, who is leading mediations and has presented both parties with a seven-point proposal. Mr Arias has warned of possible civil war if the talks fail and urged both sides to continue. “My conscience tells me that I cannot give up and must continue working for at least three more days and that is what I propose to do,” he said. Mr Zelaya, who is currently in Nicaragua, said one “must never close the door on actions of good faith” but that he doubted the mediators could achieve much. “I do not think that efforts with coup-mongers, just as with terrorists and kidnappers, will work,” he told Reuters news agency. He later said his supporters were “organising internal resistance” in preparation for this return to the country, which he indicated could happen at the weekend. Mr Zelaya called on the international community to act in his support and to “back us in restoring democratic order”. The US, which has supported Mr Zelaya, urged the political rivals to reflect on the “significant progress” made at the talks and to “commit themselves to their successful conclusion”. State Department spokesman Robert Wood said the Organisation of American States (OAS) and other interested parties “underscore their commitment to the peaceful resolution of political disputes through dialogue”. “I’m very sorry, but the proposals that you have presented are unacceptable to the constitutional government of Honduras,” said Carlos Lopez, the head of the interim government, led by Roberto Micheletti. He said Mr Micheletti’s side objected in particular to the first point of Mr Arias’s plan, which proposes “the legitimate restitution” of Mr Zelaya as the head of a reconciliation government until early elections are held in October. Mr Arias also proposed an amnesty for political crimes committed before and after the 28 June coup. Mr Zelaya’s representatives had previously said they accepted the proposal for reinstating the deposed leader and were “willing to discuss all the other points”. But following Sunday’s statement from the interim government, the delegation said the talks were effectively over, although it had not ruled out future talks with the coup leaders. “This dialogue with this commission of the de facto, military coup government is finished,” said Rixi Moncada, one of Mr Zelaya’s representatives. Mr Zelaya was forced into exile on 28 June. The interim government has said he will be arrested if he comes back. It prevented an earlier attempted homecoming on 5 July. On Sunday, Mr Zelaya said it was his right as a Honduran to return to the country and “absolutely no-one” would stop him, Reuters reported. He later suggested he would return at the weekend, saying by then his supporters would have “all the necessary activities” in place, “as laid out in the law and the constitution and international mandates,” the agency quoted him as saying. 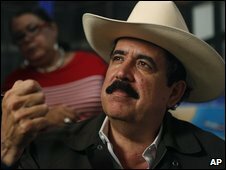 It would not be hard for Mr Zelaya to cross the long and mountainous border between Nicaragua and Honduras, but there is great concern that it will lead to bloodshed if he does. Mr Arias said he was concerned that a “good part” of the Honduran population own firearms. 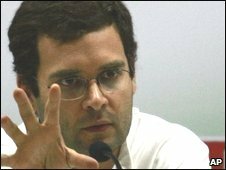 “What happens if one of those arms shoots a soldier? Or if a soldier shoots an armed civilian? 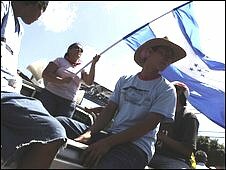 “There could be a civil war and bloodshed that the Honduran people do not deserve,” he said. Speaking to the EXPRESS in Nicaragua on Saturday, Mr Zelaya said he would not agree to anything that gave concessions to the people who ousted him from office. Arturo Corrales, representing Mr Micheletti, had accused Mr Zelaya of bad faith. He said Mr Zelaya’s insistence on forming a unity government went against the spirit of the talks and showed “a wish in Honduras to keep violating our constitution and our laws”. The negotiations in Costa Rica have benefitted the interim government by buying it time, and also because it has been treated with an equal status to the elected leaders, says our correspondent. Mr Micheletti heads a military-backed government, which ousted Mr Zelaya amid a dispute with Congress and the courts. Mr Zelaya had planned to hold a non-binding public consultation to ask people whether they supported moves to change the constitution. His critics said the move was unconstitutional and aimed to remove the current one-term limit on serving as president and pave the way for his possible re-election. The chief political analyst at the British Embassy in Iran has been charged with “acting against national security”, reports suggest. The UK Foreign Office is investigating claims by his lawyer that he has been charged and will stand trial shortly. A senior cleric has said some of the nine embassy staff arrested last month will be tried for inciting protests over Iran’s disputed election. Britain denies fomenting discontent to undermine Iran’s Islamic regime. Iranian news agencies have said all but one of the embassy staff have been released, although the UK government claims two remain in custody. Foreign Secretary David Miliband says he is “deeply concerned” about the situation and has asked for talks with his Iranian counterpart. A Foreign Office spokeswoman could not confirm reports that the adviser had been charged. “We are still investigating. The situation remains extremely unclear and fluid,” she added. News agencies have reported the lawyer as saying he has not yet been able to meet with his client or see the text of the indictment. 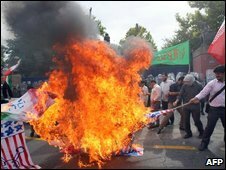 Protests gripped Tehran and other Iranian cities after June’s presidential election, amid claims the vote had been rigged in favour of the incumbent, President Mahmoud Ahmadinejad. On Friday, Ahmad Jannati, leader of the Iran’s supreme legislative body the Guardian Council, said: “The British Embassy had a presence and some people were arrested. However, he did not say how many employees would be tried or on what charges. Iran’s semi-official Fars news agency reported this week that one of the detainees had played a “remarkable role during the recent unrest in managing it behind the scenes”. Nine embassy staff were held last weekend. Britain says all but two have now been freed. Mr Miliband said Britain was urgently seeking clarification from Iran about any possible trial or charges, which have reportedly been brought against one employee at Evin prison in Tehran. “We are confident that our staff have not engaged in any improper or illegal behaviour,” he added. The Foreign Office later confirmed that Iranian envoy Rasoul Movahedian had been summoned and the same message reiterated. European Union governments have summoned Iranian ambassadors to protest against the detentions. An EU official told us that, in addition, visas for Iranians holding Iranian diplomatic passports would be suspended. The official said other measures, including the withdrawal of EU ambassadors from Iran, would be considered if the two staff members were not released. Our diplomatic correspondent says Ayatollah Jannati’s speech marks a significant deterioration in the already bad relationship between London and Tehran. 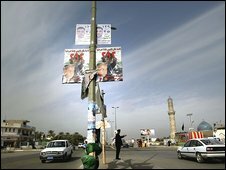 Tehran has repeatedly accused foreign powers – especially Britain and the US – of stoking unrest after the election. In the fallout from the crisis, Tehran expelled two British diplomats and the UK responded with a similar measure. Iran’s Supreme Leader, Ayatollah Ali Khamenei, last month described Britain, as the “most evil” of its enemies. The issue of how to deal with Iran is set to dominate the summit of the Group of Eight (G8) industrialised nations in Italy next week. Some EU countries have urged caution, arguing that Europe should engage with Iran, not isolate it. But if the embassy staff are put on trial, the EU may have few other options than to tighten the diplomatic screw, correspondents say. 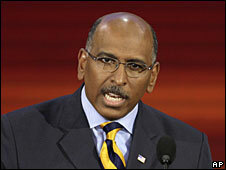 Michael Steele has won the election to be chairman of the Republican National Committee, becoming the first African-American to lead the party. Mr Steele won in the sixth ballot, with 91 votes out of a possible 168. His nearest rival, Katon Dawson, received the remaining 77 votes. Correspondents say Mr Steele was the most moderate of the five candidates who stood for the position. The favourite, incumbent chairman Mike Duncan, pulled out after two rounds. “We’re going to say to friend and foe alike, we want you to be a part of us, we want you to with be with us, and for those who wish to obstruct, get ready to get knocked over,” said Mr Steele in his acceptance speech. He rose to prominence in 2006 when he stood for a senate seat in Maryland. He had previously served as the state’s Lieutenant Governor. After his senate defeat, he served as the chairman of GOPAC, a conservative political action committee. As chairman of the Republican National Committee, Mr Steele will be in charge of overseeing the party’s campaigning efforts nationwide. He fought for the position on a platform of rebranding the party and finding ways to use new technology to connect with the conservative grassroots. Mr Duncan had been the favourite to win the election, but dropped out after receiving fewer votes than expected in the first two rounds of voting. 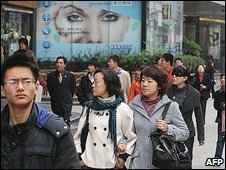 December also marked three decades since China began reforms that have transformed the economy and the country’s fortunes. But even before the document was published, the police started visiting some of the 300 or so original signatories. 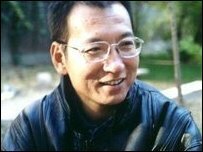 Writer and dissident Liu Xiaobo is believed to be under a form of house arrest at an undisclosed location in Beijing. The authorities have yet to state publicly why the 53-year-old has been detained. He is believed to be the only signatory being held by the police, but others have experienced other kinds of harassment. Police went to journalist Li Datong’s work unit to look for him. He was not there, but now he knows the authorities are watching him. Shanghai lawyer Zheng Enchong has been taken in for questioning four times since the document was published. Li Boguang, another lawyer, was invited to meet with a Chinese security official at a Beijing coffee shop, where for more than an hour he had to explain why he had added his name to the charter. “The official didn’t say anything. He just listened to my reason and then left. This is how they operate,” he said. China usually metes out severe treatment to anyone who criticises the system, but Mr Li said he still thinks it was right to sign the charter. “Change requires ordinary citizens, particularly intellectuals, to speak out. This will slowly influence the government,” he said. Another signatory, academic Xu Youyu, experienced a different kind of pressure. Mr Xu, a professor at the Chinese Academy of Social Sciences, was told by his boss that signing the document broke Chinese laws. “I told him that was nonsense. That’s absolutely not the case,” the expert in Western philosophy told us. He was then asked to retract his signature, which he refused to do. “I am willing to pay any price for this,” he added – even going to prison. Mr Xu has also been told that he will not now be allowed to write the forward to the book of a colleague. “The publishers received an order from the centre saying that everybody who signed their name to the charter had lost their qualification to publish any article or any book,” he said. The document that appears to be causing so much concern among senior Chinese leaders is one of the most important published in several years. It was based on Charter 77, which in 1977 called for respect for human and civil rights in what was then Czechoslovakia. Charter 08 says the Chinese government’s approach to modernisation has been “disastrous”. It “deprives humans of their rights, corrodes human nature, and destroys human dignity,” the document says. It calls for a political system that guarantees human rights, freedom of expression and protection for private property. It has also stirred interest abroad. Several Nobel laureates, among others, have written to Chinese President Hu Jintao asking him to release Liu Xiaobo. China’s leaders are saying little about Charter 08 – or the detention of Mr Liu. But President Hu made it clear in a speech to mark the 30th anniversary of the country’s reforms that China would not adopt Western-style democracy. Willy Lam, of the Chinese University of Hong Kong, said China’s leaders are nervous about calls for political change. This nervousness has increased with the country’s economic problems, which could create a restless population receptive to calls for political change. Mr Liu’s detention is a case of “killing the chicken to scare the monkey”, according to Mr Lam. This is a Chinese idiom that suggests making an example of one person to keep others in line. Alaska Governor Sarah Palin is guilty of abuse of power, according to a probe by the state legislature. But the McCain-Palin campaign team said that the report showed Mrs Palin acted within “proper and lawful authority”. The report could have a significant effect on Republican hopes of winning next month’s US presidential election. 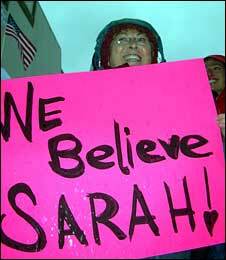 Mrs Palin has always denied any wrongdoing, and her supporters say the charges are motivated by her political opponents. She stood accused of dismissing Mr Monegan for refusing to sack a state trooper who was in a bitter custody battle with her sister. The report concluded a family grudge was not the sole reason for the dismissal, but was a likely contributing factor. However, the report said that the actual sacking of Mr Monegan was not beyond Mrs Palin’s legal powers. Speaking after a bipartisan investigating panel reached its decision on what has become known as Troopergate, Mr Monegan said he felt “vindicated”. The panel found Mrs Palin in violation of a state ethics law prohibiting public officials from using their office for personal gain. “I find that Governor Sarah Palin abused her power by violating Alaska Statute 39.52.110 (a) of the Alaska Executive Branch Ethics Act,” investigator Steve Branchflower concluded in the panel’s 263-page report. Legislators do not have the power to take formal legal action against the governor; that would be up to Alaska’s Personnel Board. If the Board decides Mrs Palin violated state law, the case will be referred to the president of the state Senate. 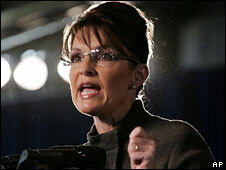 Mrs Palin’s lawyer said that the report had not been conclusive. “In order to violate the ethics law, there has to be some personal gain,” said Thomas Van Flein. And Alaskan state Senator Gary Stevens, a Republican, said there were “some problems” with the finding. “I would encourage people to be very cautious, to look at this with a jaundiced eye,” said Senator Stevens, after the report’s release was announced. Several Republican politicians had earlier attempted to have the investigation stopped on the grounds that it was politically motivated. The investigation into the affair began before Mr McCain selected Mrs Palin as his running mate in August. The US presidential race has now become so polarised both Republicans and Democrats will likely see the report’s findings as vindication for their own trenchant views about Mrs Palin. Alaska’s governor will either be seen as the victim of a Democratic party hatchet job, or a hypocrite. Most voters, for now at least, seem more concerned about who will extract them from the current economic crisis, than any questions about political infighting in far-off Alaska, our correspondent adds. Mrs Palin maintains she fired Mr Monegan in July over a budgetary dispute. But Mr Monegan said he was dismissed for resisting pressure from Mrs Palin and her husband, Todd, to fire State Trooper Mike Wooten, Mrs Palin’s former brother-in-law. Mr Monegan said he simply wanted the truth to be made known. “The governor did want me to fire [Mr Wooten], and I chose to not,” he told the Associated Press news agency. Todd Palin has admitted he did publicise what he called the “injustice of a violent trooper keeping his badge”. But he said his wife, who did not give evidence to the enquiry, then told him to drop the matter. The McCain campaign on Thursday issued its own report, written by its staff, stating that the Alaska governor was not guilty of any wrongdoing. The 21-page report suggests that the allegations against Mrs Palin stem from a conspiracy planned by a former campaign opponent of hers, Andrew Halcro, and Mr Wooten. The McCain campaign says the inquiry has been muddied by innuendo, rumour and partisan politics. 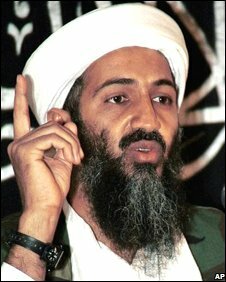 To many people Osama Bin Laden is the ultimate barbarian, to others an elusive Muslim warrior. Most know him simply as the world’s most wanted man. Few would imagine him as a published poet or wedding raconteur. But now a host of previously unpublished speeches made by the man accused of planning the 9/11 attacks on the US are to be made public. They include sermons and readings delivered at a wide range of events from weddings to jihadi recruitment sessions. The material was discovered on a dozen of 1,500 cassettes found in al-Qaeda’s headquarters in Kandahar, Afghanistan, which was evacuated during the US-led invasion in 2001. Encompassing recordings from the late 1960s until the year 2000, the collection includes hundreds of sermons by Islamic scholars, political speeches by al-Qaeda’s top strategists and even footage of live battles – as well as recordings of the group’s reclusive leader. According to one US linguistics expert, Flagg Miller, who has spent five years analysing the material, the tapes provide an audio library of Bin Laden’s development as an orator. The assistant professor of religious studies at the University of California, Davis said the recordings also offer “unprecedented insight” into debates within Bin Laden’s circle in the years leading up to the attacks on the US on 11 September 2001. Prof Miller’s analysis of the tapes shows Saudi-born Bin Laden to be a skilled poet who weaves mystical references as well as jihadist imagery into his verse, reciting 1,400-year-old poetry alongside more current mujahideen-era work. “[The readings] were sometimes given to large audiences when he was recruiting for jihad in Afghanistan… and other times they were delivered at weddings, or to smaller audiences, possibly in private homes,” Prof Miller, a linguistic anthropologist specialising in the Middle East, told. Poetry is important to Bin Laden’s core audiences of radical Islamists and disaffected youth, and his verses have been picked up by his followers around the world and used in their own work, said Prof Miller. “The violence and barbarism of war can sicken anybody and poetry is a way to frame that violence in higher ethics,” he said. However, some scholars have objected to the publication of Bin Laden’s poetry, saying the work has only sparked interest because of the notoriety of its author, and that publishing the verse gives a forum to a reviled figure. In one of his own poems, Bin Laden, whose whereabouts remain unknown, refers to a youth “who plunges into the smoke of war, smiling”. “He hunches forth, staining the blades of lances red. May God not let my eye stray from the most eminent humans, should they fall,” continues the recital. The words are believed to have been recorded in the mountainous Afghan cave complex of Tora Bora in 1996, as the al-Qaeda chief made his first declaration of war against the US. Often identifiable by his distinctive monotone, Bin Laden’s recitals show him to be “the performer, the entertainer with an agenda”, said Prof Miller, who is researching a book analysing the poetry and its role in jihad. Earlier material is littered with references to tribal poetry, Koranic verses and mystical allusions – mountains, for example, are used as metaphors to help his followers avoid the temptations of the secular world. In one instance the man accused of orchestrating bombings in East Africa, Indonesia, Morocco, Saudi Arabia and Turkey, as well as the US, describes himself as a “warrior poet”, whose words will lead his followers to an idyllic refuge in the Hindu Kush mountains. 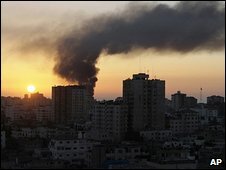 More recent recordings are both more professionally produced and more overtly political – the anti-Western rhetoric with which the world has become familiar since the 9/11 attacks. Prof Miller said that if alive, Bin Laden would still be writing poetry, which is central to the oral traditions of his tribal culture. 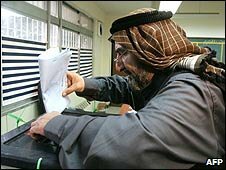 “Poetry is part of the oral tradition in the Arab world, which Bin Laden uses to tap into the cultural orientation, the history and the ethics of Islam,” he said. The tapes are currently being cleaned and digitised at Yale University in the US and public access is expected to be granted in 2010. 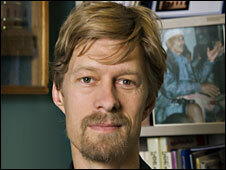 Prof Miller’s findings are published in the October issue of the journal, Language and Communication. Thabo Mbeki has formally resigned as the president of South Africa, a day after accepting a call by the governing African National Congress to quit. In a televised address, Mr Mbeki said he had handed a resignation letter to the speaker of the National Assembly. He said he would leave his post as soon as a new president was chosen. Correspondents say it is not clear who will succeed him, but the ANC appears to favour the parliamentary speaker, Baleka Mbete, as acting president. Mr Mbeki’s speech followed an emergency cabinet meeting. He is stepping down before his final term expires next year. The move comes days after a high court judge suggested that Mr Mbeki may have interfered in a corruption case against his rival, ANC leader Jacob Zuma. But during his address, Mr Mbeki made an impassioned defence of his position. There had been no effort at all to meddle with the judicial process, he said. And Mr Mbeki dismissed any suggestion he had been trying to shape the judgement for his own political ends. This was a very measured and reflective speech. Mr Mbeki began by saying that the ANC would decide the date of his leaving. “I have been a loyal member of the African National Congress for 52 years. I remain a member of the ANC, and therefore respect its decisions,” he said. This was a very clear signal that he like so many others is keen to make the transition as smooth as possible, our correspondent says. Mr Mbeki, who succeeded Nelson Mandela as president in 1999, thanked the nation and his party, the ANC, for giving him the opportunity to serve in public office. 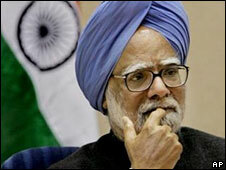 He went on to list some of his achievements, notably the country’s solid economic growth. He said there was still much to be done in South Africa, and he urged the incoming leadership to continue to combat poverty and social injustice. “Trying times need courage and resilience. Our strength as a people is not tested during the best of times… For South Africa to succeed there is more work to be done and I trust that we will continue to strive to act in unity,” he said. Parliament is likely to meet in the coming days to formalise his resignation, and select a caretaker leader. 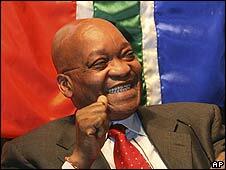 Mr Zuma is widely expected to succeed Mr Mbeki in scheduled elections next year. The decision to call for Mr Mbeki’s early resignation was taken at a meeting of the ANC’s National Executive Committee (NEC). The ANC’s secretary general said the decision to seek Mr Mbeki’s early departure as president had been taken for “stability and for a peaceful and prosperous South Africa”. This was not punishment for Mr Mbeki, Gwede Mantashe told reporters on Saturday, adding that the president would be given the chance to continue his role as mediator in Zimbabwe. ANC cabinet members are being urged to remain in government to ensure continued stability. Mr Mbeki fired Jacob Zuma as deputy president in 2005 after his financial adviser was found guilty of soliciting a bribe on his behalf. But Mr Zuma returned to the political stage to topple his rival as ANC leader in bitterly contested elections last year. Earlier this month a High Court judge dismissed corruption and other charges against Mr Zuma, saying there was evidence of political interference in the investigation. In his ruling the judge said it appeared that Mr Mbeki had colluded with prosecutors against Jacob Zuma as part of the “titanic power struggle” within the ANC. The accusation was strongly denied by Mr Mbeki. Mr Mbeki became leader of South Africa in 1999 and won a second term in 2004. Perhaps his biggest policy success has been South Africa’s rapid economic growth since the end of apartheid and the rise of a black middle class – but to the anger of many, wealth is more unevenly distributed than ever before. He has failed to convince the trade unions and the poorest South Africans that the government has acted in their interest – providing space for Mr Zuma to mobilize a powerful constituency. Domestically, his government’s handling of the HIV/Aids crisis and failure to stem violent crime in the country also weakened his hand.